Folk Alliance is like old home week, but some of the most exciting moments come when we discover a great artist we were unaware of. 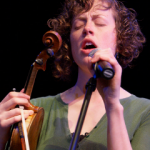 This year’s Big Find for me was Duluth Songwriter Rachael Kilgour. I love her songs. Love her voice. She is very charismatic and unconsciously makes great singing faces. I totally resonate with the progressive, activist message that underlies her songwriting which unequivocally advocates for human rights, income equality, and peace. A lot of current performers are squeamish about ruffling anyone’s political sensibility. This may be safe, but I don’t find it very interesting. Pete Seeger and Woody Guthrie were hyper aware of the power of music as an agent for social change. Rachael’s songs pull no punches, but she delivers them with an earnest clarity that makes her impossible to dislike. Making Music Together. The value of Social Music. Alan Rowoth & Sally Johnson Present: NERFA2018 BOT Showcase.